A few days ago, I discovered a dusty old tackle box while cleaning out a closet in my house - it was my first bead box. When I first started beading, I was instantly addicted and this little plastic box filled up quickly and overflowed into a large basket, which then grew into a spare room in my house. This little old box brought back all the memories of why I started beading, the eagerness to learn all about making jewelry, coming up with new jewelry designs and having fun discovering new beads and the ideas that they inspired. As I look back, I think of how lucky I am to still have the same passion about beading and jewelry design today. What memories do you have about when you first started beading? This is a simply elegant necklace that will showcase gorgeous gemstone briolettes on sophisticated sterling silver links. Create this necklace at loose choker length. This will allow the necklace to drape around the neck in a circular shape. Choose a larger link chain for added drama. The chain featured in this example has 12mm links. When cutting the chain, don't forget that the clasp that you choose will add about 1" to the total length of the necklace. Next, select one briolette per chain link. 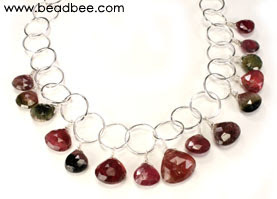 You may choose to arrange the briolettes according to color and size before wire wrapping them onto the chain. I have been saving these exquisite tourmaline briolettes and this project is perfect for them. The size of the large chain link is well proportioned to the 10mm briolettes and the rich color of the stones makes them the perfect beads to show off in this design. If you want to use smaller briolettes or other shapes, you may choose to attach more than one bead to each chain link. The result will be just as stunning. Here is a version of a lariat necklace that features gorgeous freshwater pearl bead strands sprinkled with multi-colored gemstone beads. An ornate sterling silver toggle serves as the focal point. 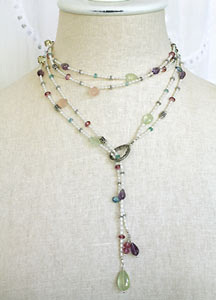 I really love the poetic combination of the rich gemstones in this necklace design. The pearls add to the classic style that can be dressed up or down. The gemstone beads used include: amethyst, pink chalcedony, green chalcedony, apatite, pink topaz, prehnite, london blue topaz and lemon quartz. 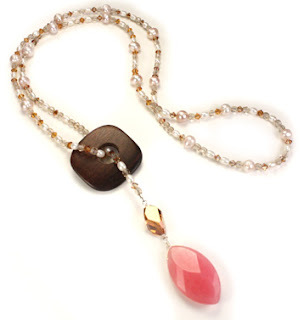 Lariat necklaces are typically designed to be long and graceful. Since I used small rice pearls, I chose to make this necklace two strands so that it would a little more dramatic. You will need one 36" strand and one 38" strand of Flex-Rite beading wire (I used medium weight, however, a few of the pearls and gemstones didn't fit. I prefer to use medium weight for the strength and am willing to sacrifice a few beads in the process. However, light weight beading wire will work fine. Start with the unfinished end of one strand, string on a crimp bead, thread the beading wire through beaded dangles and crimp. Repeat with the second strand. 1) Double Wrap - this is a great way to shorten the necklace and achieve a two strand look. 2) High Neck - wear the necklace closer to the neck for a dramatic look when wearing a low scoop neck. The long, graceful dangle can have a slimming affect and can add interest if you wear it with a simple dress. 3) Long V Neck - a more traditional necklace look, also very versatile, great with button down shirts, sleeveless tops, or turtlenecks. Lariat necklaces are designed in many different ways, depending on how it is made, a lariat necklace can also be knotted, tied, or worn as a belt. My great great grandma and her family had come to the U.S. all the way from Czechoslovakia when she was a young girl. Knowing this, I have always been really interested in all things Bohemian, especially jewelry. My first Bohemian inspired piece is what I'd like to share with you in this blog. My mom and I were in a beading store and the first thing the caught my eye was a glass bead in the form of a globe. I then found a beautiful bronze bead cap for the globe, matching chain and a clasp. To add more color, I incorporated four small glass beads that shared the same colors as the globe bead. I also chose antiqued charms that represent things I like - they help express my personality in the necklace. To make your own charm necklace, find a component to serve as the focal point, this can be a large toggle or bead. Gather your favorite beads and charms, and use wire wrapping to attach them to the ends of multiple pieces of chain to create a tassel that attaches to the focal point. 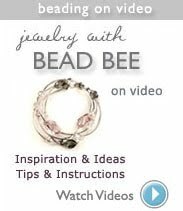 You may be surprised what you can scavenge from your bead box or parts from your old or broken jewelry. Another place I like to look is thrift stores or consignment shops where there's an array of unique pieces to choose from. The possibilities are endless, just follow your creativity wherever it takes you! When creating a multi-strand necklace, using cones can be an elegant way to bring all the strands together and finish the necklace. With good wire-wrapping, a clasp can be neatly attached for a well crafted look. 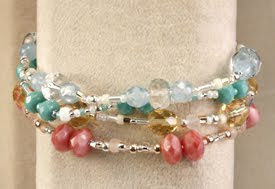 In order to use cones to finish the ends of a multi-strand beaded necklace, you will need to wire wrap a loop onto one end of a piece of 24 gauge wire. All the strands will be crimped onto this loop. Then insert the wire through the cone and wire wrap the end of the wire onto the clasp. The second end can be attached to a jump ring or extender chain. Cones are available in many different styles. Some may be plain and simple, others will be ornately decorated. You will have several options so that you can choose cones that enhance the style your beaded creations. Good craftsmanship adds exceptional quality to any handmade item, bad craftsmanship can simply ruin your hard work. Here are some simple tips to help you improve your craftsmanship and the overall quality of your handmade projects. Perfect Wire Wrapping does not require any special talent, just practice good technique and use the right beading tools. Wire Wrapping Tip #1: When creating wire wrapped loops, don't forget to make a 90 degree bend before making the loop. This helps prevent crooked loops and lopsided dangles. Wire Wrapping Tip #2: When creating wire wrapped coils, take it slow and have a steady, firm hand. You will have more control and be able to create nicer and tighter coils. You can also use a second pair of chain nose pliers to ensure tight, parallel coils - see our wire wrapping video for more details. Wire Wrapping Tip #3: A pair of flat nose pliers with tip will help tidy up your wire wrapping. The narrow tips are perfect for getting into tight spots. Wire Wrapping Tip #4: To prevent nicks and scratches on your wire, avoid an overly heavy hand. You will need to be firm, but squeezing with all your might will definitely mar your work. You can also use Tool Magic to coat your tools as another safeguard from unsightly marks on your wire work. The look of fibers and beads can be edgy or sophisticated depending on your choice of colors and materials. Our example features a soft, romantic look created from beads on headpins, attached to jump rings knotted onto a creamy, satin ribbon. 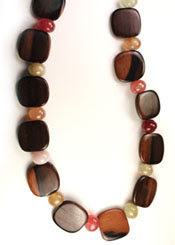 This type of necklace does not require a clasp and is adjustable in length. Simply tie around the neck at the desired length. However, if you would like to have a more structured closure, it is very simple to attach chains and findings to complete this necklace. 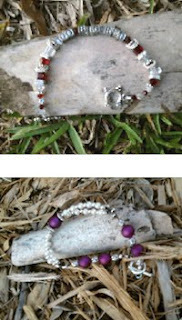 If you can wire wrap, then this will be a simple piece to create in less than an hour (depending on how many beads you use). 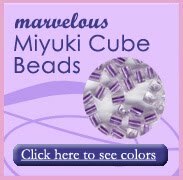 Beads - your choice, choose beads that are 8mm and smaller to keep the look light and flirty. My example includes 8mm Luster Blue Czech Firepolished beads, 6mm Milky Aquamarine Czech Firepolished Beads and 4mm Light Smokey Quartz Firepolished beads. Determine the length of your necklace, then decide where you would like to knot in beads, this may be every 3-4". At each of these spots, knot a jump ring into place. Next, attach 3-5 beads to each jump ring. 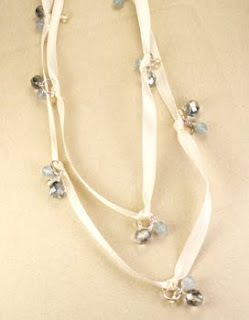 This necklace can be composed of a single strand or multiple strands of ribbon. Our example shows two strands at slightly different lengths. No clasp is needed, simply tie around neck at desired length. If you would like to attach chains and clasp, loop one end of the ribbon around an 8mm jump ring. Hand-stitch the ribbon to secure the jump ring. Repeat on the other side. Next, attach a piece of chain to each jump ring, this will allow you to adjust the length of the necklace. 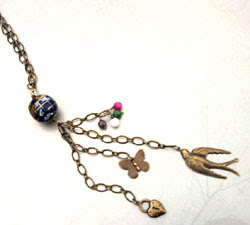 Lastly, attach a lobster claw clasp. I've been sitting, pondering what to write about, and then I figured blogging is all about the first thing that comes to your mind. Before I get into detail about jewelry I've made and sharing my ideas, I just wanted to talk about the reason I love beading so much. First of all, jewelry is such huge part of pulling an outfit together in the fashion world. It can take something as plain as a t-shirt, jeans, and flats, and turn it onto something that's really trendy and eye catching. Since I'm into both art and fashion, I'm attracted to all the different shapes and colors in beads, in combination with the colors and textures of clothes. Also, whenever I used to go shopping for jewelry, one piece (such as a necklace or bracelet) could clear my whole wallet. When making my own jewelry, I realized the amount it costs to purchase the beads is at least 40%, if not more, cheaper. If I need something for an event, I can coordinate my jewelry to go with a specific outfit I want to wear. This saves me the time I could waste searching for that "wow factor" piece, only to end up settling for something I'll only wear once. One more reason I enjoy making jewelry is that it's a great way to give gifts and people will know you put thought and heart into. Last Christmas, instead of battling overcrowded malls, I decided I would make all of my friends and loved ones a piece of jewelry that they would cherish. There's nothing that makes me happier than seeing the reactions on their faces when they pull out a necklace or bracelet that was designed just for them. So, the next time you want a new jewelry set or you need to find your friend a perfect pair of earrings, remember that only you have the ability to make them the exact way you want them to be made! I enjoy using Czech glass fire polished beads in my jewelry designs because there are so many choices of shapes, sizes and colors. 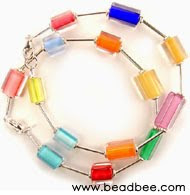 The Pantone Spring 2010 Color Report has inspired this set of four multi-colored glass bead bracelets. The Pantone Spring color palette identifies "Fusion Coral" as one of the colors which lead me to the pink coral Czech glass donut beads pictured above. I wanted to create a fun, bright set of bracelets in different colors so I also chose "Turquoise" and "Aurora" from Pantone's color palette. To complete the set, I used a milky baby blue bead, not one of the colors in the palette, but still complimentary. I strung all these beads onto gossamer stretch cord using a large eye needle. For spacer beads, I used a mix of White Toho Seed Beads. What colors are your favorites this season? Turquoise, Tomato Puree, Fusion Coral, Violet, Tuscany, Aurora, Amparo Blue, Pink Champagne, Dried Herb and Eucalyptus. Knowing the current colors of the season is important so that the jewelry you create coordinates with current fashions and also allows you to upgrade your existing wardrobe. Be inspired to create your own color palette based on your personal style. 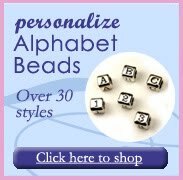 Beading offers a huge material palette so you are sure to find the colors and shades that you are looking for in Czech glass beads, Swarovski crystal beads, gemstone beads or pearl beads. Tomorrow I will post my first piece of jewelry inspired by this season’s colors. How will the Spring colors inspire you? 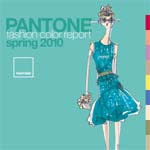 If you are obsessed with color like I am and are interested in learning more about Pantone, go to www.pantone.com. A lariat necklace is a stylish and unique design resembling a noose. Most designs are adjustable, but variations can be clasped in the front. My example does not require any findings except for two crimp beads and some wire. If you chose to use a clasp, a large, ornate toggle is a nice option. The overall length is about 36" long. I chose a neutral palette of golden peach freshwater pearls, and brown and copper beads of Czech glass and Swarovski crystals. These neutral tones help highlight the wooden centerpiece and the fuchia jade pendant, which provides a dramatic touch of color. I chose the wooden donut as the centerpiece for this necklace. 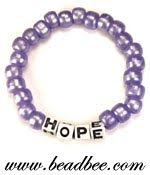 The hole is large enough for two strands of beads to pass through comfortably. One end of the necklace is permanently attached to the donut (photo shows one end of the beaded strand is looped around the donut and crimped, smaller beads are used on this end). To make this necklace, string all the beads onto flexible beading wire. I recommend using smaller beads on the end that will wrap around the donut. It is good to use beads that vary in shape and size, if your necklace is too uniform in size, it will not "catch" on the donut and stay in place. After stringing on all the beads, wrap one end around the donut and crimp in place. Then insert the second end through the donut. Add any additional accent beads and a pendant to finish the necklace. This necklace is adjustable in length by adjusting the location of the centerpiece. Since making this piece, I have created other variations and will share them in future posts.